The default wallpaper in MacOS High Sierra is a beautiful autumn lakeside scene featuring mountains frosted with a light snow, it looks fantastic but you don’t need to wait until the final High Sierra release is available to use this great wallpaper right now. 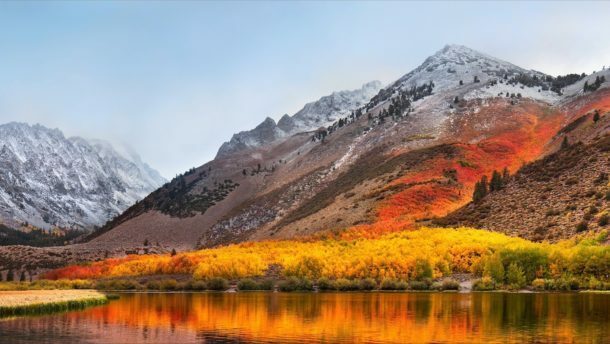 The High Sierra default background image is available at a maximum high resolution of 5120 x 2880 pixels, making it look fantastic as the desktop picture on a Mac, Windows PC, iPad, iPhone, Android, or whatever else you want to spruce up. Once you have the picture saved locally you can set the image as your wallpaper in iOS or as the background picture in Mac OS. If you enjoyed this you’d likely also appreciate the lovely new iOS 11 default wallpaper, and you might find some other great wallpapers here too. I must admit that I’ve never liked OS X default wallpapers (except maybe Aqua Blue), but this one is really something. Thanks Paul! That’s North Lake, just west of Bishop CA. Very popular spot with photographers in the fall. Been there many times, but never caught it like that! Indeed, what a phenomenal area! Too bad that place is in a state filled with so many Libtards! You have the IQ of a protozoa. California is the sixth largest economy in the world and has some of the most beautiful landscapes imaginable as you can see in this stunning scenery. The Californians you attempt to insult also invented and built every piece of technology you use and enjoy, including what you’re using right now. Nice try, Ted the Troll. I’ll believe you’re a Muslim when I believe Santa is dropping off some gifts this year. Thanks! I really love this Wallpaper of North Lake! Are you sure this is Bishop, CA. It certainly looks like it was taken in the Wasatch Mountains in Utah – one of many possible canyons there. Yes, that is why it has the name High Sierra. The mountain range outside of Bishop is the Sierras, and the lake pictured appears to be in the High Sierras (upper portion of the mountain range). Because Apple is based in California, they appear to be naming all of their new Mac OS releases after various California landmarks. The Wasatch in Utah is beautiful too though, and has many similar scenes!